2012 Ford Focus Titanium: Hatchback in Red Candy Metallic paint with a dark charcoal interior. The Titanium is a more upscale Focus, going from S, SE, SEL, to Titanium. 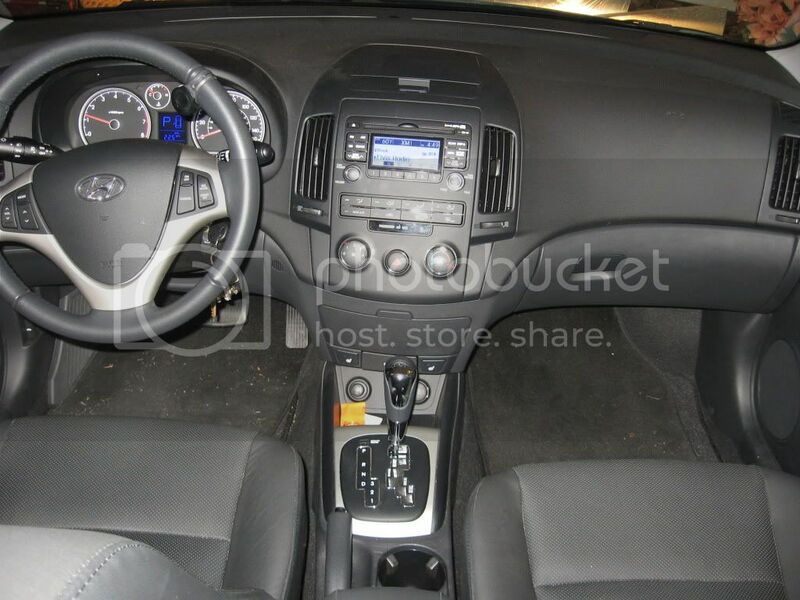 This car has cloth sport bucket seats, MyFordTouch/Sony 10 speaker sound system with Sirius satellite radio, push button start, 6-speed dual clutch transmission (DCT) behind a 2.0L GDI engine rated at 160HP/146TQ, and 18-inch alloy wheels with summer performance tires (handling pack). The average fuel economy is rated at 27/37 for this model. 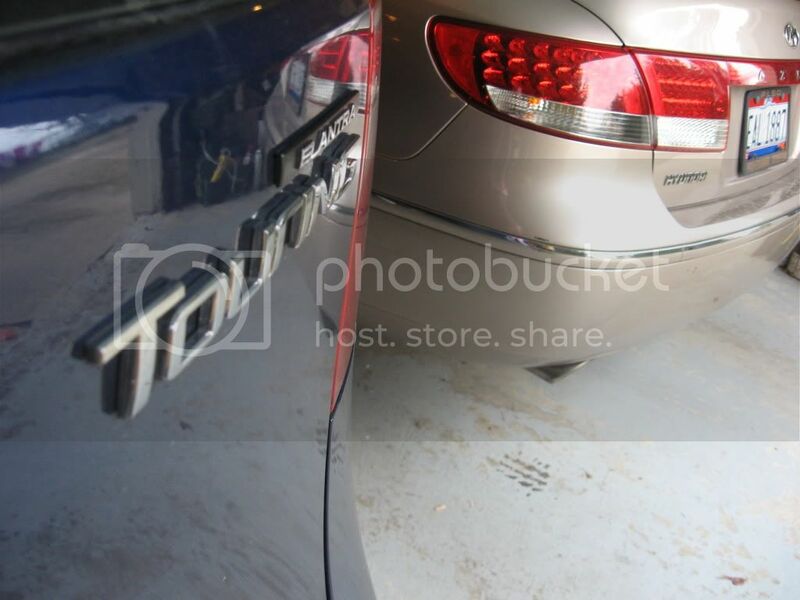 The options on this car are the Handling Package and upgraded paint. This car was a December 2011 build so it has the latest updates to MFT and the DCT transmission. 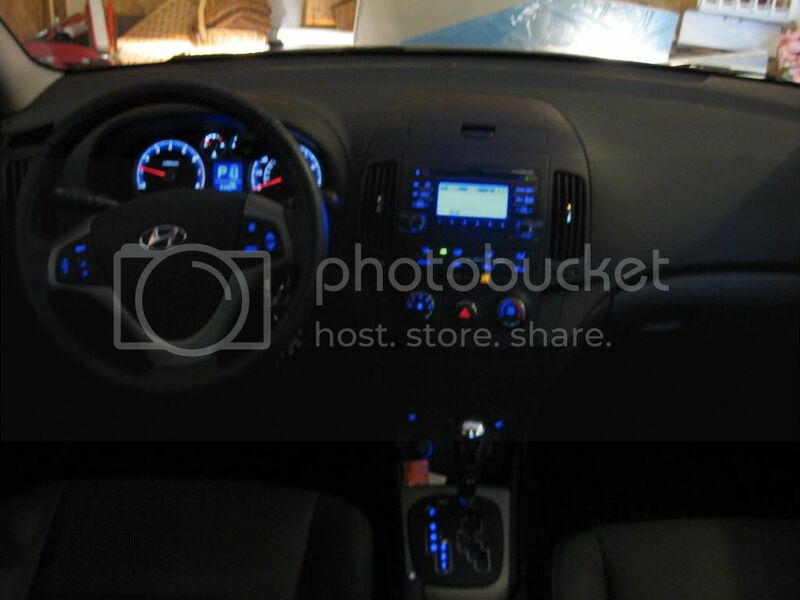 2012 Hyundai Elantra Limited: Sedan in Sky Blue Metallic with a tan/black interior. The Limited is a more upscale Elantra, going from GLS to Limited. This car has heated leather seats front and rear, 6-speaker stereo with XM satellite radio, power sun roof, 6-speed auto transmission behind a 1.8L engine rated at 148HP/131TQ with 17 inch alloy wheels with all-season tires. All of these are standard features. The only option it has is the HomeLink mirror. The average fuel economy is rated at 29/40 for this model. VALUE: The Hyundai is an outstanding value for the MSRP. Our MSRP was $21,500. Hyundai is partnered with Motozuma and will match you up to $500. The dealership sold the car for $600 off of MSRP, so the final price was $19,900 ($500 from Hyundai, $500 from me to get the Hyundai match, and $600 off from dealer). This car is an excellent value even at full MSRP. I feel that the Focus is priced too high at MSRP. It is hard to justify a car in this market segment with a MSRP of $24,485 (you can actually load up a Titanium hatchback with options and have it come in north of $28,000...). Personally, I would have never paid MSRP or even close to it. Fortunately, when it was time to buy there were plenty of dealer discounts, rebates, and Ford private cash, all totaling $3,374 off MSRP for a selling price of $21,111. This changed the entire picture and made it a great value. EXTERIOR STYLING: I compare buying a car somewhat to dating a woman. She needs to be very good looking to get me to talk to her, and when I talk to her she had better have a great personality, be fun to be around, and have a brain. INTERIOR STYLING: The Elantra feels a bit more open and roomy with the layout. The interior dimensions show the Elantra has more leg room, and clearly it does. Probably even more than the numbers suggest. It is a much better car for us to take when my son is with than the Focus due to the leg room. As far as materials used, the Focus is hands down superior to the Elantra. The interior of the focus looks and feels very upscale. Great use of soft touch plastics, leather appointments, metalized accents, gauge layout and design, etc. The leather of the Elantra is done very nicely, the Focus (when equipped with it) is top-notch. Overall fit and finish inside and out of both cars is excellent. Paint quality is superb. The only rub on the Elantra, the ugly interior they match to the Sky Blue paint. The two-tone interior done in tan and dark charcoal simply clashes. My GF loves it, but I can't stand it. The only rub with the Focus? The bleeping gas door blows open when going through the touch free car wash air dryer. It is a pressure sensitive door so it needs adjusting or a fix. SOUND SYSTEM: The Focus has MyFordTouch with Sony's 10 speaker sound system which includes and external amp and subwoofer. The MFT/Sony system is a great factory sound system. One of the best I have heard. Two of the MP3s I used to compare the systems with were: Fedde le Grand's So Much Love (Original Club Mix) and Jason Gray's Remind Me Who I Am. The Sony system hits hard down low, is punchy, has good depth, and is quite transparent through the range. The MFT interface works fine, as does Sync. My phone is recognized every time and streaming audio through BT works very well. There is so much involved with MFT that I have yet to experience it all. The Elantra's system lacks punch down low (pretty much non-existent even in the more upscale system with the tech package) and is at times too bright on the top end. It has trouble recognizing my phone (or my GF's) so we need to get it in to get it looked at. Have not been able to do any audio streaming as yet. COMFORT: The Focus sport bucket seats are a dream to sit in. Very supportive. Although my base Titanium has cloth seats, I spent quite a bit of time test driving cars with leather and they are as comfortable, if not even more so. Some don't like the headrests in the Focus, but as I like to sit quite upright I like how they feel. The Elantra's seats are very nice, too. Supportive without being too firm. The headrests are a tad bit further back so I don't like them as much as the Focus'. QUIETNESS: I took my sound meter along for some drive time. The Focus at start up and idle is very smooth a quiet. Under normal acceleration it is remarkably quiet and smooth. The Elantra is a bit more noisy at start up and under acceleration, but not bothersome at all. For cruising down the road, my nod goes to the Focus, mainly because of the tires and overall sound deadening. The Elantra comes with Hankook Optimo H426 (215/45/17 LRR) all-season tires and frankly, I find them to be adequate at best. They impart a fair amount of road noise into the cabin and are not even close to the best all-season tire for snow driving. The Focus Handling Package comes with Michelin Pilot Sport 3's (235/40/18 LRR) and are a very quiet tire at cruise and even in the cold handle quite well. As they are a summer high performance tire it is advised to not drive them in the snow or at or below freezing temps. Good thing I have a beater to drive on days like these. PERFORMANCE/DRIVEABILITY: The Elantra is a decent car to zip around town with. It handles well, has a decent ride (tire noise notwithstanding), and has decent acceleration. The transmission shifts very smoothly. We seldom use Eco mode. Great visibility out of the windows. I will say, there is something about the steering that is just not quite right. I can't quite put my finger on it, but it requires just a bit too much attention to guide down the highway. The only thing that keep this from being an excellent car to take on a long road trip is the tires. Simply too much road noise. The Focus is a driver's car and is simply a blast to drive. It is a car that begs to be driven each and every day. The Handling Package imparts a slightly firmer ride, but having driven a Focus sedan without it the ride between the Elantra and the Focus is very similar. The 6 speed DCT transmission has been flawless in performance. Very fast and smooth shifts. The Sport mode adds even more fun, holding the shift points higher and downshifting on its own when needed. The steering is spot on. The only thing that keeps the Focus from being my choice on taking the family on a long distance drive is less leg room in the back. For two people, or a family with small kids, it would be just fine. Which is quicker? The Focus. We did a couple of side-by-side frum digs and frum rolls and the Focus won every time (yes, the Eco was off in the Elantra). The margin was closest from a dig, with the Elantra spooling up a tad bit quicker right off the line. However, from a 10 MPH roll the Focus in Sport Mode trounced the Elantra. FUEL ECONOMY: Last week we took at 205 mile round trip with the Elantra. It was about 85% highway and 15% urban/city. Maximum speed was 60 MPH and the terrain was about half rolling hills and half fairly flat. We gassed up at the same pump at the start and finish, filling it up to the second click both times. 87 octane gas. Gas here is reformulated for winter with a maximum 10% ethanol. Air temp was approx. 35 degrees, RH was about 60%, and the wind was calm on the way down and approx. 10 MPH headwind later on the way back. 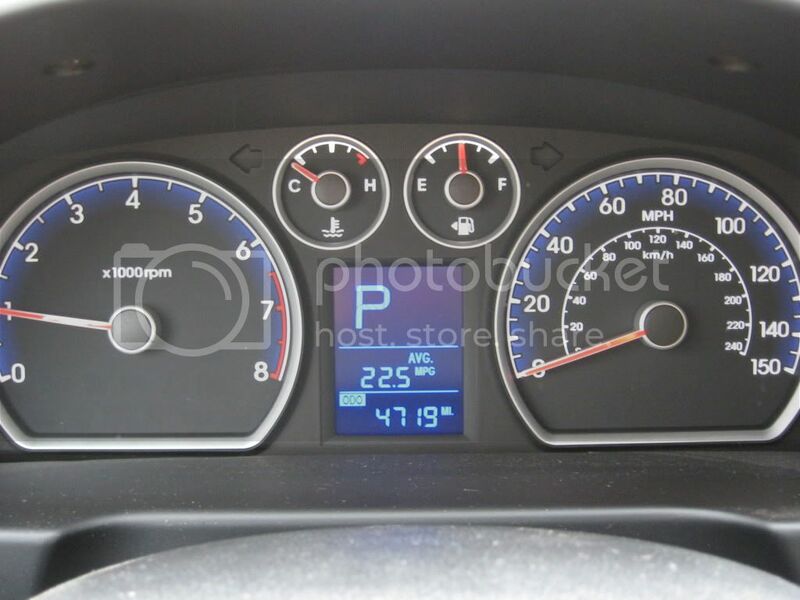 I drove and although I did not hypermile it (Eco was off), I did not drive spirited, either. Averaged 36.6 MPG (205 miles / 5.6 gallons). Not bad at all considering winter driving and winter blend gas. Took the same exact trip with the Focus a few days later. Temps were about the same, air was a bit drier (RH 35%). Wind was light and variable. 87 octane used from the same pump as before, both at start and finish of trip. Again, filled to the second click. Got 35.8 MPG (205 miles / 5.72 gallons). In the city both are getting mid-20's. Longer warm up times are killing this MPG segment. WARRANTY: Hands down the Elantra wins here. It comes with a factory new vehicle limited warranty of 5 years/60,000 miles, limited 10 year/100,000 mile powertrain warranty, and 7 year/unlimited mile corrosion warranty. This is a great value and a huge selling point for a car in this price range. OVERALL: The Focus has taken some hits in the media and with the motoring public over the past several months due to issues with the MyFordTouch system and the DCT transmission. My December built Focus has the latest major revisions to both and I will say they both work flawlessly. The Elantra has no major issues that I am aware of. Some have reported issues with the steering and others have agreed the tires are not the best. I can see why it won the North American Car of the Year award when compared to an earlier production Focus with issues with the MFT and DCT. I think the outcome would have been different had they compared it to one with the updates that I have...maybe next year Ford, maybe next year. Both cars are very good cars and you really can't go wrong with either car, especially now that Ford has worked out most of the bugs from the Focus. As I said in the beginning, some of what I would write would be subjective and what is important to me may not be important to you. I think the Focus is a better car based on what is important to me. Your results may vary. Great review. I like both of the cars you reviewed. Of course I like the look of the 2012 focus much better than the Elantra. I also like the interior much better. I agree completely with the rear of the Elantra... I'm not really a fan of it but still. The price and warranty for the Elantra is just awesome. I believe thats why I'm starting to see a lot of Hyundais on the road today. Though they have that cheap name to them, or so some say, the warranty is pretty much proving that they up'd the reliability of them. Great review. Thanks for taking the time. It's nice to have the viewpoint from someone with access to both. How are the head lights on the elantra? I agree on the road noise in the elantra is annoying as hell. I think the focus looks way better. My mother in law has 2012 elantra touring not a bad car but I think I would take a focus over it. The HID head lights are horrible and the suspension is stiff and bangs over all the bumps in the road. I also think the mileage is lower than it should be for this class of car. Binyana2011, excellent review. 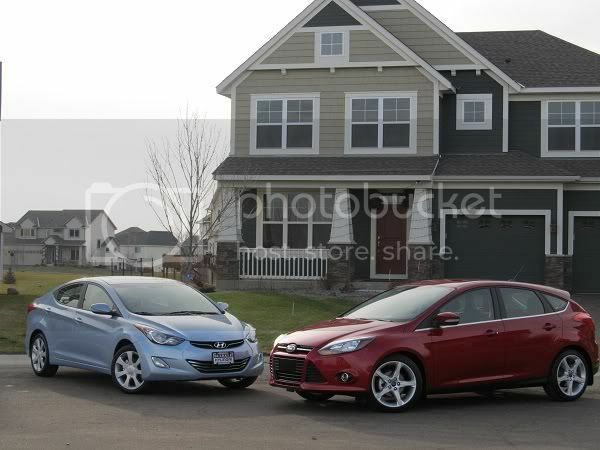 I looked at both cars and paid the additional for the comfort and sound system of the Focus over the Elantra. Well.... here's a few pics. 22.5 avg, is low for a 1.8 IMO. Not the greatest interior focus is a lot better looking and feel. I do like the blue ambiance. Thanks for your comparo write up. Just from the picture of the two, IMO I can see/perceive the Focus being a car of more substance. Also IMO the Focus just looks like a higher cost machine, hence it is. The Focus looks like it is in another league. The European reviews of the i40w & i40 (Sonata & Sonata wagon) conclude the same when compared to the Ford Mondeo. The i40s get good comments on value for $, and good design looks, but lose out in the driving dynamics and overall feeling of solidity/substance. Those are pictures of the Elantra touring, not the Elantra sedan Binyana is describing. Completely different interiors. Different cars altogether for that matter. That tan car in the pic is an Azera, not an Elantra.